School starts at 8.50am each day. The school is open for pupils to come into the hall and line up from 8.40am. 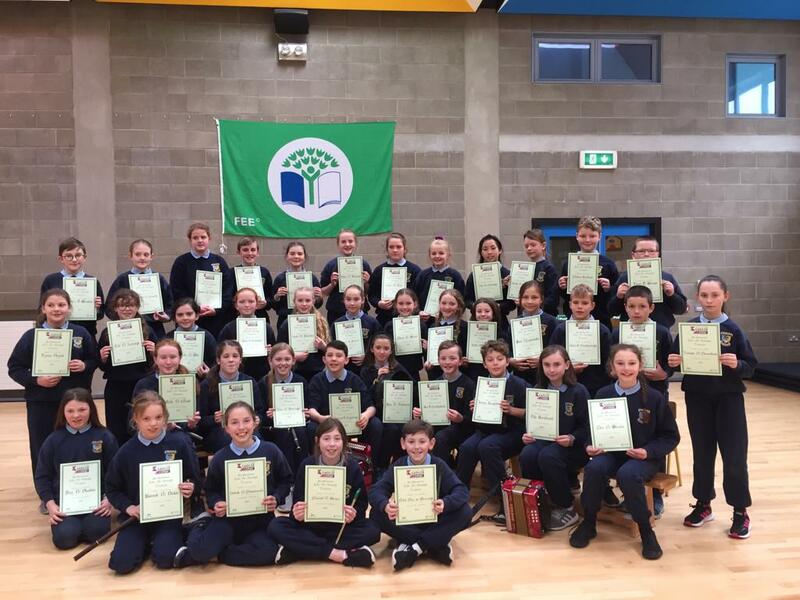 Junior and Senior Infants finish school at 1.30pm. All other classes finish at 2.30pm. The first break (sos) is from 10.50am to 11.00am and lunch is from 12.30pm to 1.00pm. Please send a note to your child’s class teacher on the day they return to school. This can be done in your child’s homework journal. What should I do if I want to meet with my child’s teacher? The School encourages communication between parents and teachers. Parents are welcome to make an appointment to meet their child’s class teacher any time during the school year. Do the students in Carrig National School wear a uniform? Yes. Our school uniform consists of a navy jumper/cardigan, navy trousers/skirt/pinafore, a light blue shirt and a navy & blue tie (ties available from the school office). Our school crest to sew onto the jumper/cardigan is also available from the school office. Navy socks and black footwear are worn with the uniform. Children wear the school tracksuit (available in A Sportsman’s Dream), a light blue t-shirt, sports socks and runners on P.E. days only. School shorts and t-shirt are worn in fine weather. Is there any procedure for dropping/collecting children from school? Yes. As there are so many children being dropped off/collected at the same time a one-way traffic management system is in place. Please approach the school from Ballycommon both morning and evening and avoid turning at the front of the school. If possible, please park on the left letting children out on the footpath. Please be conscious when parking at the school that you do not block access to the church or prevent other vehicles from driving away from the school.